ALOT Appbar by ALOT - Boost Your PC. 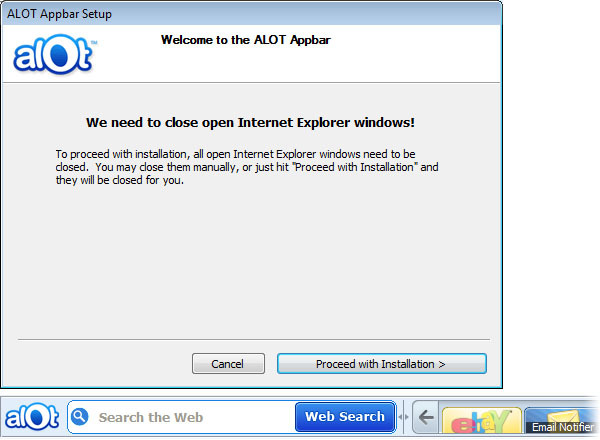 ALOT Appbar is a web browser plugin in the form of a toolbar. ALOT Appbar allows customized 'apps' to be added to the toolbar including social media apps. Appbar Web Search Users who opt-in to the Discover program help ALOT identify the best sites on the web and improve ALOT Apps. Enabling ALOT Discover will allow the appbar to collect anonymous data and browsing habits that help ALOT to identify which sites users prefer. Download Boost and enjoy your PC. Remove ALOT Appbar from your PC. Why should I uninstall ALOT Appbar? Removing unwanted toolbars is usually a good idea. ALOT Appbar, like other web browser extensions, can potentially have adverse effect on your web browser's and overall PC's performance and stability. To the right of the list item, click the Uninstall button and Boost will completely remove ALOT Appbar from your PC. Use Add/Remove Programs control panel in Windows makes to uninstall ALOT Appbar. Follow the appropriate instructions below to use this control panel. Select ALOT Appbar from the list of programs, and click Uninstall. Alternatively, right-click the program and select Uninstall. Select ALOT Appbar from the program list, and click Uninstall. Alternatively, right-click the program and select Uninstall. Select ALOT Appbar from the list of programs and click Remove. Boost helps you remove ALOT Appbar and clean your PC.